In September, the United Nations Security Council imposed, unanimously, its toughest economic sanctions yet on North Korea. The goal: inducing Pyongyang to dismantle its nuclear weapons program, including the warheads it has accumulated, which are estimated to number between a dozen to 30, perhaps more. Laudable though the goal of “denuclearization” may be, and President Donald Trump’s promises notwithstanding, it has become a pipedream. Kim Jong-un will never part with his nuclear weapons cache, which the regime has developed doggedly, and despite international condemnation and pressure, over decades. It’s time to accept this reality. It was one thing to try and terminate Pyongyang’s nuclear arms program when it had yet to produce warheads and long-range ballistic missiles capable of delivering them— the goal of the ' negotiated between the Clinton administration and the government of Kim Jong-il, Kim Jong-un’s father, as well as of the 2003-2007 Six-Party Talks under President George W. Bush— but now that North Korea has nuclear arms, neither pressure nor rewards will work. Kim Jong-un takes the possibility of the United States attempting “regime change” by military means seriously—and all the more given Trump’s rhetoric. Kim and his senior officials point to the fate of Saddam Hussein and Mu'ammar Gadaffi as proof that North Korea needs the ultimate deterrent. Pyongyang is doubtless adept at propaganda, but that is not a reason to dismiss everything it says as false, especially because North Korea no longer trusts China to defend it and probably hasn’t in decades—and Saddam and Gadaffi, the latter after he agreed to dismantle his nuclear arms program, are history. Furthermore, no state that has developed nuclear weapons has been willing to part with them. Pyongyang certainly won’t be the first to do so. Instead, it will weather the economic sanctions and political condemnation: think of India and Pakistan. Moreover, China and Russia cannot be counted on to increase the pressure to the point that Kim’s regime could collapse, leading to unpredictable consequences on their borders. And for all of President Donald Trump’s rants directed at “Little Rocket Man,” there’s no way to destroy North Korea’s nuclear weapons and missile sites without courting the calamity of Kim attacking South Korea with his numerous artillery pieces and short-range missiles, killing tens of thousands of South Koreans (as well as Chinese and Americans living in Seoul) in minutes. Greater Seoul, let’s remember, has a population of over 25 million, making it the world’s fifth largest conurbation. Managing a nuclear North Korea means, concretely, maximizing the probability that deterrence will work—that Pyongyang will not use its nuclear arms because it understands that if it does the United States will respond in kind, eviscerating the North Korean state. Despite the shibboleth that Kim is irrational and thus beyond the realm of deterrence, he has never done anything that suggests that he is prone to suicide. What conceivable political goal would be achieved by launching a nuclear attack on South Korea and Japan, to say nothing of the United States? One way to strengthen deterrence is to create a hot-line-like system that links North Korea, Russia, and China. It would enable instantaneous communications among the leaders of these countries and reduce the probability that a military crisis on the Korean peninsula could careen out of control and lead to nuclear war. An additional measure—which would certainly be politically controversial in the West and challenging given Pyongyang’s obsession with secrecy—would involve providing North Korea the technological assistance it needs to avert the possibility that its leaders, fearing a decapitating first strike, might launch their nuclear weapons because North Korean early warning systems falsely reported an incoming nuclear attack. If you think this is the stuff of sci-fi novels and movies, peruse Scott Sagan’s Limits of Safety, a chilling account of the erroneous warnings from American detection systems about a Soviet nuclear strike. As a third step, the United States would make clear that, while it will not pursue regime change, any attack launched by North Korea on Japan, South Korea, or an American territory would be met with an overwhelming military response. 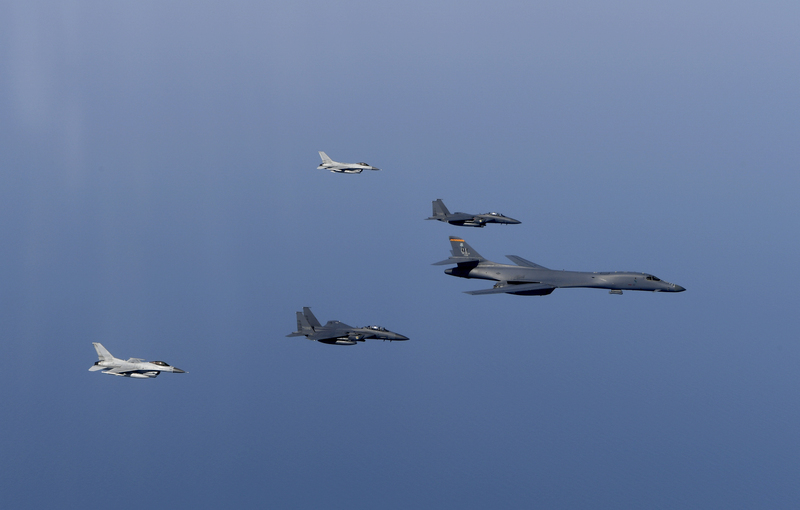 These three measures could be supplemented with an end to patrols over South Korea and international waters off North Korea by American nuclear-capable B-1B bombers, a reduction in the frequency of U.S.-South Korean military exercises, the normalization of political relations between Washington and Pyongyang. The timing and sequencing of these steps would, of course, be hammered out in negotiations and can’t be formulated a priori. To set the stage for the difficult talks that achieving all this will surely require, calming the now-stormy waters by accepting the Chinese and Russian freeze-for-freeze (Pyongyang suspends its ballistic missile tests in exchange for Washington and Seoul suspending their military exercises) would make sense: It is hard to see a downside. The measures should be supplemented by efforts to reduce the chances of a non-nuclear war between North and South Korea. These could include verifiable agreements under which each side pulls its forces further back from the Demilitarized Zone (DMZ), refrains from deploying armaments in the vacated zones, provides advance notification for military exercises and troops movements above a certain size, reconfigures its forces so that initiating standing-start attacks becomes more difficult, and reduces the number of tanks, artillery pieces, and short-range missiles. Given that the numerical balance (though not when it comes to the quality of weaponry) favors the North, it would undertake steeper reductions, save in combat aircraft (and frigates and destroyers, but the focus of the cuts would be on land and air forces), where South Korea has the quantitative edge. But other parts of the deal should provide Pyongyang incentives to accept deeper cuts in its forces. To be sure, getting talks going on implementing these measures, let alone actualizing them, won’t be easy, not least because of the longstanding animosity between North Korea and the United States. Yet Washington has conducted talks and normalized relations with more than one dictatorship before (think of Mao’s China in the early 1970s, when the blood-drenched Cultural Revolution has not yet concluded), so it is senseless to refuse negotiations with North Korea on the grounds that its human rights record is appalling. North Korea has advanced toward an operational nuclear capability much faster than experts had anticipated. True, it needs to take additional steps, such as the miniaturizing its warheads and ensuring that they are not destroyed by the heat and vibration they will encounter upon reentering the earth’s atmosphere. But it is a safe bet that Pyongyang will clear these hurdles, so it is more realistic to abandon the objective of getting North Korea to renounce nuclear weapons and to ensure military stability in a world that, like it or not, will feature a nuclear-armed North Korea. To coming around to this strategy, Washington will have to abandon the maxims that have long governed official thinking—under Democrats and Republican administrations alike. That will be tough, but then we are in a tough spot and the stakes are high—and the old remedies just won’t work.